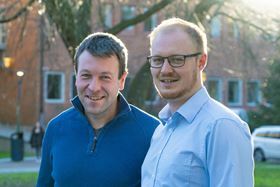 Christian Müller (left) and David Kiefer (right) from Chalmers University of Technology. Photo: Johan Bodell/Chalmers University of Technology. Researchers from Chalmers University of Technology in Sweden have discovered a simple new tweak that could double the efficiency of organic electronics. OLED-displays, plastic-based solar cells and bioelectronics are just some of the technologies that could benefit from their new discovery, which involves ‘double-doped’ polymers. The majority of our everyday electronics are based on inorganic semiconductors like silicon. Crucial to their function is a process called doping, which involves weaving impurities into the semiconductor to enhance its electrical conductivity. It is this that allows various components in solar cells and LED screens to work. For organic – that is, carbon-based – semiconductors, this doping process is similarly essential. Since the discovery of electrically conducting plastics and polymers, a field for which a Nobel Prize was awarded in 2000, research and development of organic electronics has accelerated quickly. One example is OLED displays, which are already on the market, including in the latest generation of smartphones. But other applications have not yet been fully realized, due in part to the fact that organic semiconductors have so far not been efficient enough. Doping in organic semiconductors operates through what is known as a redox reaction. This means that the dopant molecule receives an electron from the semiconductor, increasing the electrical conductivity of the semiconductor. The more dopant molecules that the semiconductor can react with, the higher the conductivity – at least up to a certain limit, after which the conductivity decreases. Currently, the efficiency of doped organic semiconductors has been limited by the fact that the dopant molecules can only accept one electron each. Now, in a paper in Nature Materials, Christian Müller and his group at Chalmers University of Technology, together with colleagues from seven other universities, demonstrate that it is possible to move two electrons to every dopant molecule. "Through this 'double doping' process, the semiconductor can therefore become twice as effective," explains David Kiefer, a PhD student in the group and first author of the paper. According to Müller, who is a professor of polymer science, this innovation is not built on some great technical achievement. Instead, it is simply a case of seeing what others have not seen. "The whole research field has been totally focused on studying materials which only allow one redox reaction per molecule," he says. "We chose to look at a different type of polymer, with lower ionization energy. We saw that this material allowed the transfer of two electrons to the dopant molecule. It is actually very simple." Their discovery could allow further improvements to technologies that are not currently competitive enough to make it to market. One problem is that polymers simply do not conduct current well enough, and so making the doping techniques more effective has long been a focus for achieving better polymer-based electronics. Doubling the conductivity of polymers with the same amount of dopant material, over the same surface area as before, could represent the tipping point needed to allow several emerging technologies to be commercialized. "With OLED displays, the development has come far enough that they are already on the market," says Müller. "But for other technologies to succeed and make it to market something extra is needed. With organic solar cells, for example, or electronic circuits built of organic material, we need the ability to dope certain components to the same extent as silicon-based electronics. Our approach is a step in the right direction." This discovery furthers fundamental knowledge and could help thousands of researchers to achieve advances in flexible electronics, bioelectronics and thermoelectricity. Müller and his research group are now researching several different applied areas, with polymer technology at the center. Among other things, his group is looking into the development of electrically conducting textiles and organic solar cells. This story is adapted from material from Chalmers University of Technology, with editorial changes made by Materials Today. The views expressed in this article do not necessarily represent those of Elsevier. Link to original source.